Qt Quick Controls 2 offers a selection of container-like controls. Each type of container can be used to group a set of controls together. The following sections offer guidelines for choosing the appropriate type of container, depending on the use case. ApplicationWindow creates the root window of an application, and makes it easy to add an optional header and footer to that window. Frame is used to layout a logical group of controls together, within a visual frame. GroupBox is used to layout a logical group of controls together, within a titled visual frame. 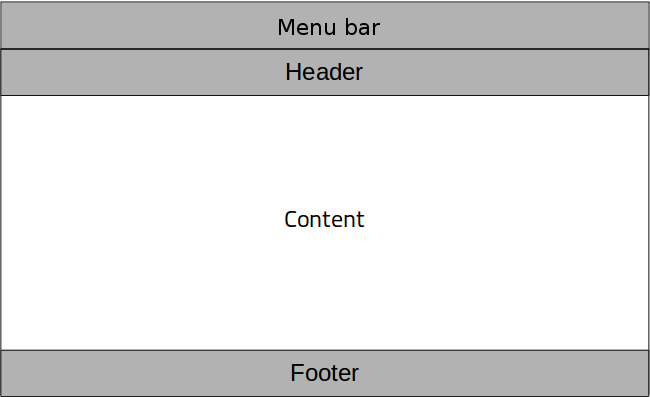 Page provides page-specific header and footer items. It is perfectly possible to use ApplicationWindow for setting the header and the footer, but if you have a header and footer which varies per screen, then it is better to use Page. Pane provides a background color that matches with the application style and theme. Pane does not provide a layout of its own, but requires you to position its contents, for instance by using a RowLayout or a ColumnLayout. ScrollView provides scrolling for user-defined content. StackView organizes content pages into a stack using a last-in-first-out principle: the last item to be "pushed" onto the stack is the first one to be removed, and the top-most item is always the one that is visible. SwipeView organizes content pages into a swipable strip. TabBar organizes content pages into tabs. ToolBar is a container of application-wide and context-sensitive actions and controls.